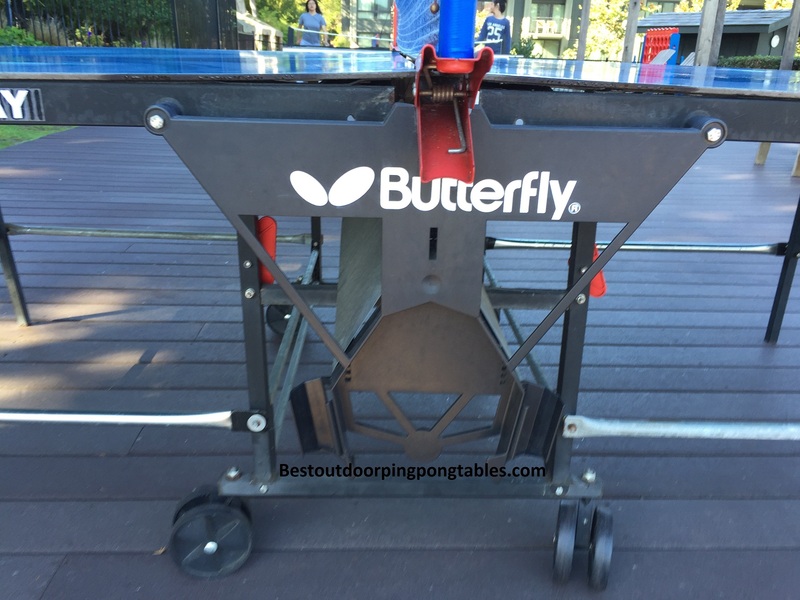 Butterfly doesn’t make many outdoor ping pong tables, but their TW24B is the most popular of their offerings and consumers like the price point and features on the table. The table is available in blue or green surface colors and typically retails for about $800. The Butterfly Outdoor Playback Rollaway is the highest quality of the 3 outdoor tables they offer – Outdoor Home Rollaway and Sport Outdoor Rollaway are the others. The Outdoor Playback Rollaway weighs 140 pounds, features a 1 ½ inch steel frame/rim around the top and has a ¼ inch Synthetic Laminate Top (SLT). 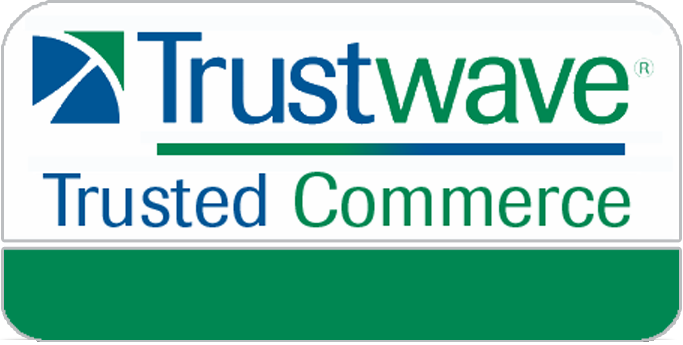 Our company is located in Portland, Oregon – the heart of the Pacific Northwest where rain and gloomy days are common. That doesn’t keep us from getting outdoors even with a bit of moisture. 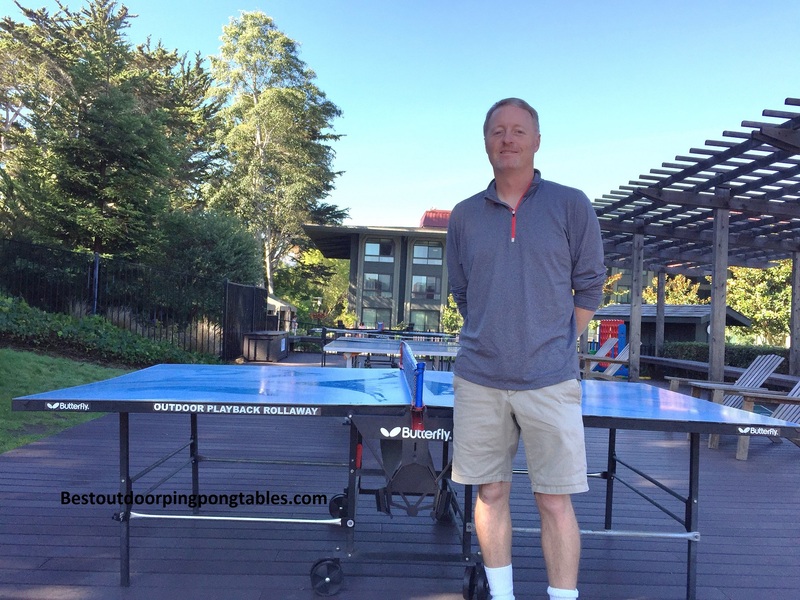 Our collection of outdoor ping pong tables has provided us the opportunity to play on several leading brands and given us a unique take on how each table holds up in tough conditions. The Butterfly TW24B Outdoor Playback Rollaway is stored outdoors year round on our premise (covered most of the year). It does get exposed to rain water and other outdoor conditions. Assembly – The table does not show up at your doorstep all put together. That is something you will have to take on. We found owner reviews ranging in time spent from 1 hour to 3 hours. The table requires 2 able bodies to get it done right. We have put together dozens of ping pong tables and this one was no different than the rest. Look over the instructions first and then get the table parts all layed out in front of you. Once you get organized, the rest goes smoothly. The table took us 1 and 45 minutes from start to finish to put together. Could it be easier – most definitely. Our experience with Killerspin tables or even those from JOOLA are that assembly could be down to 15 minutes. If putting things together like a ping pong table are not your forte then consider hiring someone to do it or go with a brand/model like Killerspin or JOOLA with easy assemblies. Table Quality/Durability – We like the welded chassis and the square steel legs. The synthetic laminate playing surface is sealed to withstand outdoor elements and keep it weatherproof for years to come. You get a 5 year warranty on the top and a 3 year warranty on the frame. The frame features 1” square steel legs, a slightly stronger support than you will get on the Outdoor Home Rollaway. The net posts and net stay attached to the table whether in playback mode or storage. We will say that the nets on almost all these outdoor tables take the most abuse from the sun. You will typically see sun rot destroy the nets long before the rain, wind or snow would ever effect them. That’s why we suggest a cover for the table just to prolong things like the net and to keep the table from getting dirty. There is a 1 ½ inch steel railing rim that goes around the table to protect it from damage. The steel rail helps keep the table from chipping or potentially warping due to moisture. With over 5 years playing on it, we have found the table to have held up well. We’ve had ours in rain for years and it also takes unrelenting sun during the summers. Playability – We have found the Butterfly Outdoor Playback Rollaway table to have a good ball bounce compared to cheaper outdoor tables. Topspin balls really react off the playing surface and the same goes for slice. Even for amateurs that just hit flat/push balls, the table has a true bounce and feel to it. We still prefer the Killerspin or Cornilleau models for outdoor use and easy of assembly, but the Butterfly TW24B is an excellent buy in this price range. Safety/Storage – Storage mode is fairly compact, but not as good as you’ll find on the Killerspin models that feature 2 separate table halves and very tidy storage positions. There are safety levers on each half of the table so that putting the table up into playback mode or storage mode is safe even for kids. We like the Kettler and Cornilleau safety mechanisms on their tables best – much easier to use and secure into place. Positives – The TW24B is a table we recommend to families all the time based on price, playability, and durability. At close to $800, the table is in that sweat spot for outdoor table tennis tables. 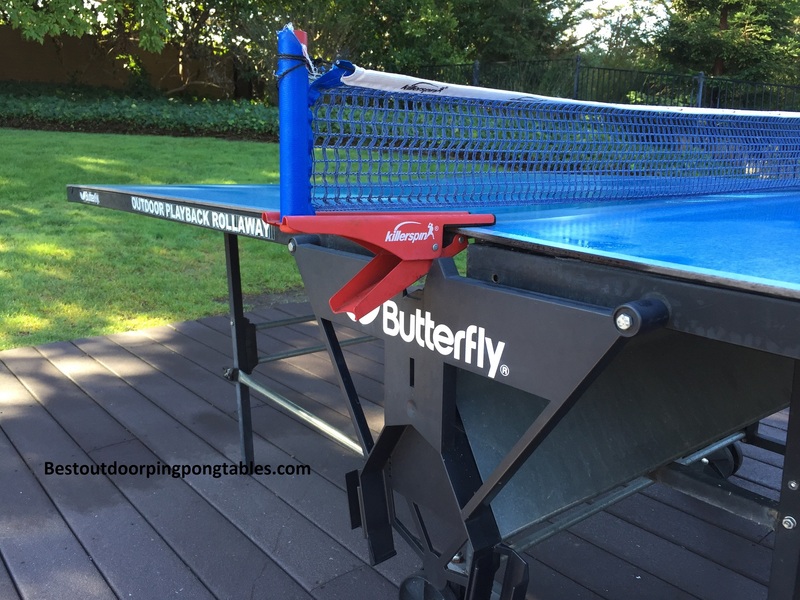 Sure you could spend $1000 or more for the Cornilleau tables (they are nice), but most families can get away with the Butterfly Outdoor Playback Rollaway and still have a great time playing ping pong outdoors. The synthetic laminate top holds up superbly and is weatherproof – you may see a little fading over time but that doesn’t affect the playability. The net stays attached even in playback/storage mode, so once it’s on you don’t have to mess with it again. There are built in safety features so kids will stay safe while using the table. Drawbacks – The assembly is too complicated and could easily be reduced with slightly better manufacturing. Many other leading brands like Killerpsin, Cornilleau, and JOOLA keep assembly to a minimum on their models. Something Butterfly should consider with future models. The feet are not adjustable when trying to play on uneven surfaces. If you are playing ping pong outdoors, odds are you will be on grass, pavement, or even dirt and those surfaces aren’t always as level as hardwood floors or carpet indoors. 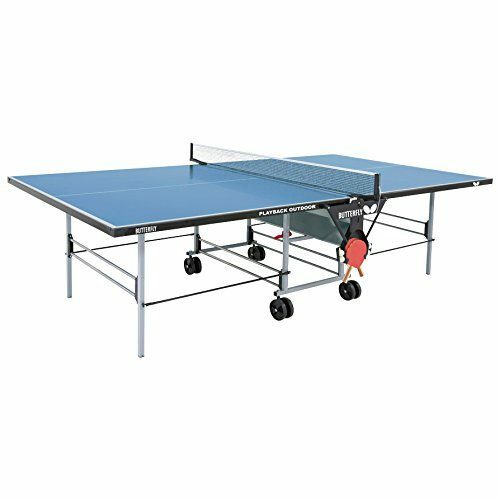 Therefore, any outdoor ping pong table should have adjustable legs/feet that can be raised or lowered to keep the playing surface level. Hopefully we will see that on newer tables. The table is also not ITTF approved – not a big deal but something we would like to see from Butterfly. Lastly, the 5 inch double wheels are not as sturdy as you see on the JOOLA Nova DX or the Killerspin MyT7 Breeze. Given that you need to move the table around outdoors on grass, dirt, or decking, it would be nice to have solid wheels that roll smoothly. 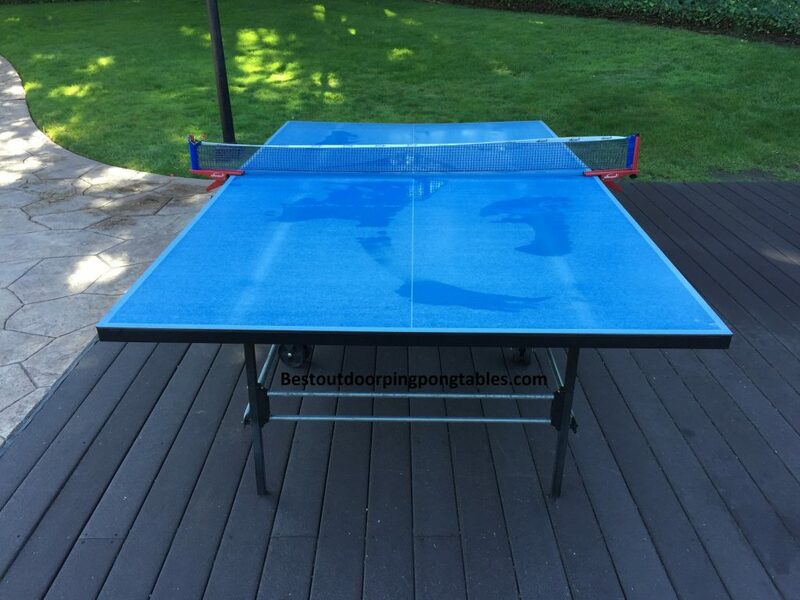 Ping pong tables are a great way to relax and enjoy the outdoors during the summer months. Perfect for patios, lawns, street use, and more. Stay patient with the assembly process on this table and after that it’s pure enjoyment. We have provided a video to the right to show the table and all it’s features. There is also a PDF file link to the instructions (see it here) in case you want to take a quick look and determine if it’s something you can take on. Amazon and other retailers of ping pong tables are starting to offer an ‘assembly fee’ where you pay to have a local handyman come out to assemble the table for a fixed cost. We give the table a 4 out of 5 stars. You can browse the collection of Butterfly tables on their website – go here.